Teresa said out of the blue staring out into the dark corners of the garden from the balcony, swaying her body side to side that drives me dizzy, Snow is coming. It’s only November and the cold night is still bearable. Winter hasn’t arrived. Snow is coming, she said again pointing towards the Holly tree. Watch. And I clued in. Oh no, Teresa. Not again. A dusting of snow settled in the garden. Then I saw it. Something playing and jumping around. I have to squint my eyes to see what it really was. A white cat as white as snow. Cats don’t like snow or do they? I ignored it. I don’t want to play with snow. I don’t want to be involved in another CATastrophy. You have to help me she begs. I would if only she would listen to me. I already suggested trapping the cat before the cold snap comes went to a deaf ear. She is Mother Teresa. Prays and hopes to God that all will be well. It did not. Every day coming home from work, I don’t hear the end of the cat. Inundated by her concerns for a cat, I had enough. In a stern voice, ‘call me when you catch the cat!’ Finally, she and her husband used a raccoon trap, caught the cat, placed it one of the vacant apartments and called me as soon as I came home. As I walked into the apartment, I could smell the stench of rotten flesh emanating from the cat. Good Lord. The cat is in bad shape. The collar was entwined between her neck and armpit that dug into the tissue. I could hear Teresa’s mind blaming herself for waiting far too long to catch the cat. It’s useless to go there, Teresa, best to handle the situation, answered her telepathically. We must take it to emergency animal hospital. Teresa hesitated. I know what she was thinking, the cost involved. I assured her not to worry, I will take care of it for I cannot allow the cat to go through another night of agony. Thank goodness there is one animal hospital that is open late at night. 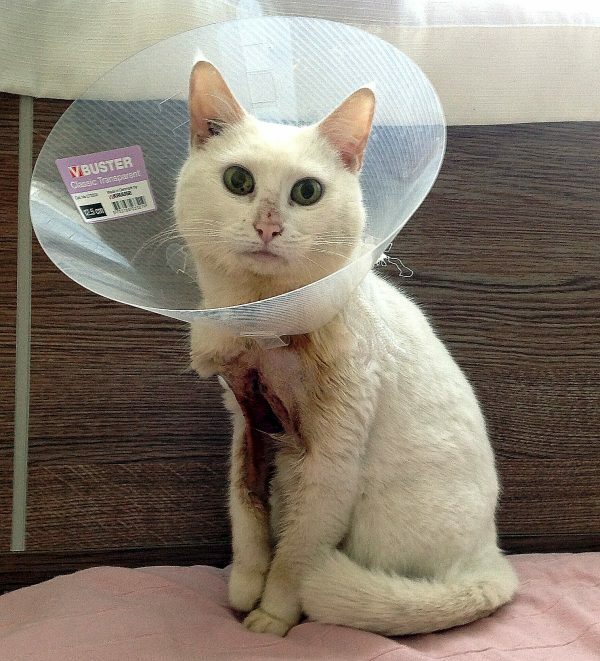 The vet did his best to cut the collar off, clean the surrounding wound and provided medication. Teresa is more than happy to nurse the cat to good health, and I am more than happy not to take care of another cat. I already have Maurice and Lucy. I’d rather pay the bills. The cat is female, and Teresa named her Snow. Oh no. You can’t possibly give it a name, or you will become attached to it. While she was busy with the cat, I was busy looking for the owner. There were no notices in Lost and Found. Teresa’s imagination is so far-fetched how the cat ended in the garden, and I am too realistic to even conceived that it was deliberately abandoned. I called SPCA or Vokra if they want to take in another cat. The center was overflowing with animals that they refuse to take a damaged cat. Don’t blame them. It was April that they trapped the cat. Five months! Five months that the poor cat lived in the bush. I know they feed it daily. I saw the empty dishes under the Holly Tree when I was winterizing the garden. The year, 2015. Snow stayed with Teresa. Snow melted my heart. Snow is here to stay. The year, 2018. This entry was posted in Cat and tagged Animal rescue, Cats, LifeandDeath, Snow, Story by Perpetua. Bookmark the permalink. It is really snowing now in Vancouver. Finally. That is a happy ending.